This module showed that the theories of supply and demand can be applied to a variety of real world issues. Market outcomes can be evaluated based on the amount of net value created for society, which can be measured by consumer, producer and social surplus. Price ceilings and price floors result in deadweight loss–the loss of economic value caused by operating at an inefficient quantity of output. Let’s return to the example of the minimum wage. Careful analysis shows that imposition of, or increases in the minimum wage have significant distributional effects. In other words, there are winners and losers from the policy. The winners are workers who continue to have a job, but are now paid a higher salary. The losers are businesses who have to pay more for their employees. This increase in production costs will be passed on, in part to consumers who will end up paying higher prices for the businesses’ products. So consumers lose also. The big losers, though, are the people who had jobs at the lower wage, but lose them when the minimum wage is increased. Which employees are most likely to lose their jobs, the most experienced and skilled, or the least experienced and skilled? Don’t forget that ultimately what matters is the size of these effects. These are the technical details that policy analysts will look at before making any recommendations to decision makers. Figure 1. Groupon Gift Card. Image by Mike Mozart, CC-BY. Consider Groupon, a website which offers significant discounts on purchases at businesses people frequently use. It’s not unusual to obtain 50% off the normal price. Why do customers like Groupon? Because it increases the consumer surplus they obtain on purchases. Why do businesses offer Groupon campaigns? Part of it is advertising, to attract customers who aren’t familiar with those businesses. 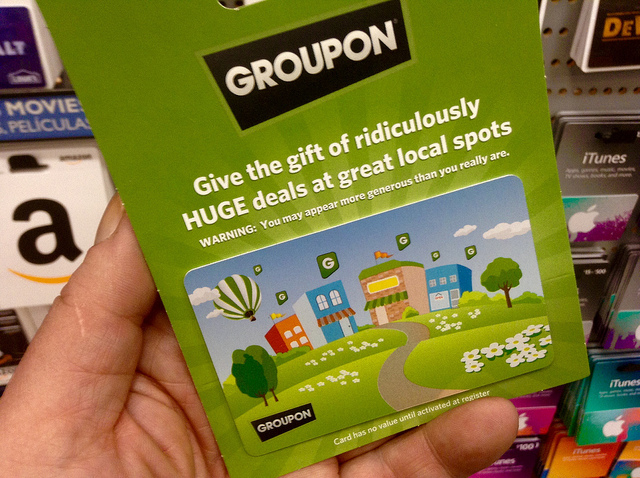 Some businesses offer regular Groupon deals. They must be doing this to increase their producer surplus (i.e., profit). This is likely part of a larger strategy, called price discrimination, which you will learn more about when you study the theory of the firm. For now, it is enough to understand that Groupon campaigns enhance producer surplus. Since both consumer surplus and producer surplus increase, we can say that total economic (or social) surplus has increased. This is just another way of saying that transactions benefit both parties, or as economists would say, this is a more efficient outcome for society. Computing the additional consumer and producer surplus tells us by how much economic surplus has increased.